Fossilguy.com: Fossil Articles and Topics - Excavations and Specific Paleontology Topics. What is a Fossil? 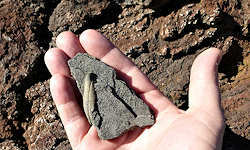 How fossils form? Fossil Olives from Greece. Where Mythology and Paleontology Collide. One of the oldest Devonian tetrapod trackways on earth! Why is there a VAST difference? There was more than just T-rex! Shark History and Evolution: A journey from the very first sharks to modern sharks! Different types of shark fossils. There's more than just teeth! Why are Shark Teeth and other fossils different colors? Learn the real facts about the Megalodon Shark! How big was that Megalodon that your fossil tooth came from? Is Megalodon Alive... No! Here's Why. Great Article on the Evolution of Megalodon. This is a great introductory book about fossils. It explains what fossils are, how fossils form, and how they lived. It is chalk full of spectacualr images of all kinds of fossils, and gives the history of fossil discoveries. It's a great book book for anyone getting into fossils. This is another great introductory book about fossils. This visual book concentrates on fossil hunting. It gives a historical perspective and goes over some world famous fossil localities.